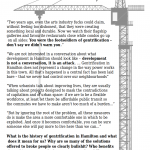 For the past several years, we’ve been talking quite a lot about gentrification here in Hamilton. In the current moment, as the vanguard of art galleries decisively give way to boutique shops and condos, as sections of town are repurposed into bedroom communities for people who work in Toronto but can’t afford to live there, what do we mean when we talk about gentrification? Two years ago, even the arts industry fucks could claim, without feeling too dishonest, that they were creating something local and durable. Now we watch their flagship galleries and favourite restaurants close while a Starbucks and McMaster satellite campus open in Jackson Square, with condos going up on all sides. 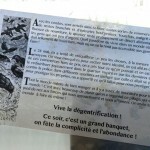 You were the footsoldiers of gentrification – don’t say we didn’t warn you. On the morning of Friday, Sept 6th, the people occupying the lot next to the Moreau lofts were evicted by the Montreal police, acting on the landlord`s request. 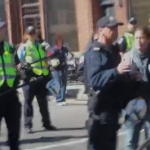 The lot, also belonging to the same landlord, was squatted to denounce the eviction of the hundred or so people living in the lofts of 2019 Moreau street. 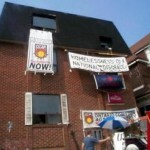 The city had ordered the eviction after safety inspectors judged the building to be dangerous for its occupants. Could you tell us a bit about yourself and how you became involved with OCAP?